The unique town has Swedish, Finnish and Russian architecture but many of its historic buildings are neglected and in danger of being torn down. The statue of the city fortress’ founder – the legendary Swede Torkel Knutsson – has been carted off from his pedestal for ideological reasons on numerous occasions... yet always put back again. Vyborg has been frequently compelled to alter not only its way of governance but also its religion and ethnic composition too. Russian, Swedish and Finnish hands have molded the layout of the city and its buildings – sometimes bolstering each other’s work, and at other times erasing it. Some buildings disappeared in peacetime, while others were lost in time of war – and some of them have been put back in place later as historic landmarks. After the World War II many buildings, including the Old Cathedral, were left standing in gloomy ruins. For the last half-century Vyborg has been left to dilapidate. Old buildings malinger unrepaired and unrenovated, unfit for use – and then, under the pretext of concern for their hazardous condition, these historic buildings are torn down by investors and developers wanting to clear the way for new projects. It's another case of Brusselization. A first acquaintance with the city usually starts with its Soviet years – the solemn neoclassical 1950s rail station. The baggage section of the station, however, is a remnant of the previous Finnish station built in 1913 – of which the rest was destroyed in WWII. Two stone bear-statues from the former station have been relocated nowadays, and guard two of the city's parks. In contrast, the bus station is a simple and unadorned constructivist structure. The Finnish architect Uno Ullberg, who held the post of the city's chief architect for quite a while, was involved in the station’s rebuilding. The streets from the bus and rail stations to the city center illustrate building styles of the late 19th and 20th centuries – the functionalist and Northern modern styles. They are broad and leafy, flanked with granite-faced houses sporting large glazed windows, stained-glass panels, decorated gables, turrets and bay windows, from whose walls stucco animals and the heroes of Nordic epics peer out. The city's primary attraction and landmark is the Fortress & Tower of St. Olaf, part of whose foundation has been preserved since the 14th century. Today it houses the local history museum and an observation platform at the tower's cupola, for a bird's-eye view of the city. From the tower we get a clear view of the Old Town, easily recognized by its single looming bell-tower of the Old Cathedral. Beyond the Old Town, the higgledy-piggledy medieval lanes run short and the regular European layout begins, only to disappear at a distance into a morass of Soviet residential and light-industrial constructions. Like many of Vyborg's main sights, the imposing 16th century Swedish Round Tower stands out from the surrounding buildings. This incongruity was even advanced as a reason for demolishing it, but in the 1920s they instead turned into in a peculiar kind of cafe. By the seaport, there's a modern semicircular building, another work of Uno Ullberg's. Built originally as an art museum and school, today it houses the local art gallery, which is a subsidiary of the Russian State Hermitage in St. Petersburg. The grassy hill across from the fortress is home to a stern building that looks like some kind of barcode – also of Ullberg's design, built as the State Archives Department. The verdant space of Red Square has the City Library, built in 1933 by the most famous of Swedish architects, Alvar Aalto. Sadly, this acclaimed masterpiece of Modernism is also falling into perilous disrepair. Of late, nearly a whole quarter of the buildings in the Old Town district have been torn down. Russian and Finnish buildings from the modern period have been simply demolished, because they'd been allowed to fall into a hazardous state. Architects and other experts concur in believing that this is far from the end of this, and the destruction of the city's architectural heritage has to be halted. 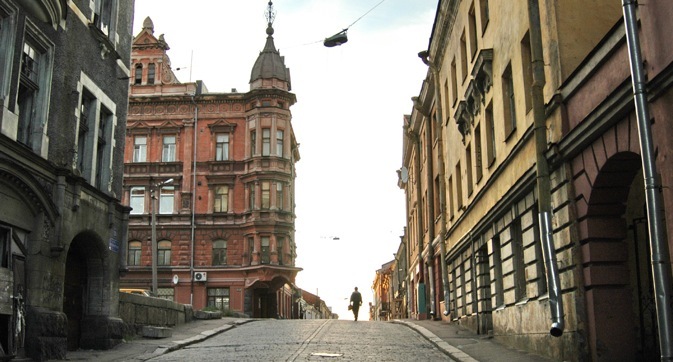 Currently there's a feeling that almost everything in Vyborg is under the threat of demolition – from Swedish 15th century buildings to Finnish apartment-houses of the 1930s. All this is an additional reason to take the chance to visit Vyborg soon – before it becomes a sad memory of what once was.